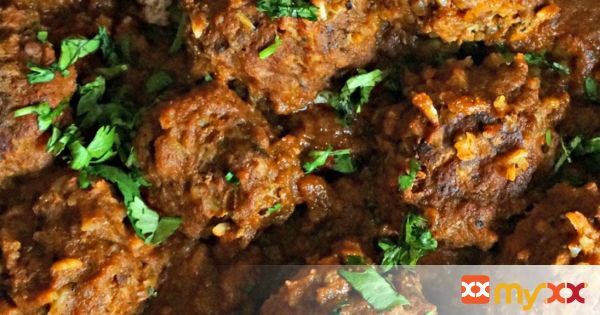 Chipotle Porcupine Meatballs, cooked in a chipotle sauce. Serve as a appetizer or as a meal. 1. To make the sauce: preheat a large skillet over medium heat with oil and add onions. Stir until soft then add garlic and cumin and cook another one minute, until fragrant. Place onion mixture along with tomatoes, chipotle peppers and salt in a blender and process until smooth. 2. Make the meatballs: In a mixing bowl, combine all ingredients thoroughly with hands, but don’t over mix. Wipe out the skillet used to make the sauce, then return back to medium heat. Add the meatballs and brown well on all sides. Do this in batches if necessary so the meatballs don’t steam instead of sear. 3. Return all meatballs back to the skillet and pour the sauce over them. Bring to a simmer, stirring occasionally for 45 minutes. Cover the skillet and simmer an additional 15 minutes until meatballs are cooked through. Serve immediately and garnish with cilantro if desired.